Senseon® Secure Access, the award-winning, smart successor to traditional locks and keys, announced today that it will showcase its hidden, cabinet-level, electronic locking system at NeoCon 2017 on June 12-14 in Chicago. Senseon, the Retail Technology Solutions award winner in the 2017 GlobalShop Product Design Competition, was recognized for its product design advancements in innovation, function and aesthetics. The award is sponsored by the International Interior Design Association (IIDA). “We are enthused about showing NeoCon attendees how Senseon provides a more effective, efficient and attractive way to protect high-value inventory while enhancing the customer experience in virtually any commercial environment,” said Senseon Solutions Marketing Director Greg Rewers. Senseon locks withstand up to 250 lbs. of break force, making them four times stronger than a typical CAM lock. Senseon locks are tested to ensure durability for more than 50,000 cycles of use. A built-in manual-override switch lets users open cabinet drawers and doors during a power outage. Senseon eliminates the need to replace broken, stolen or lost metal keys. An auto-relock function keeps contents secure at all times. Auto-open, easy-close and touch-release features improve efficiency, convenience and aesthetics. Installation requires no electrical or wiring knowledge. Plug-and-play Senseon components are easy to install and use. A user simply taps an RFID card, fob or wristband near the reader to unlock a cabinet. 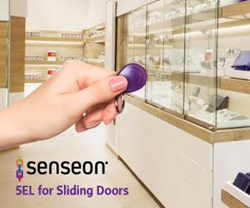 One reader can control up to 15 cabinet doors or drawers; a Senseon token can be affixed to an existing ID badge. Using a Senseon token or badge, a system administrator can add or delete users’ access with minimal effort. Senseon integrates seamlessly with cabinetry of nearly any design, shape, size or construction, including display cases. Under-mount, side-mount and stand-alone options are available. The recently introduced 10EL electronic lock allows simple retrofitting of an existing cabinet for Senseon use. Senseon technical experts work with their clients from start to finish to ensure the right solution for a project. To learn more, visit Booth 7-1093 at NeoCon or senseonsecure.com/newsroom. The Senseon® Secure Access is the smart successor to the traditional lock and key for cabinetry. This hidden, cabinet-level, electronic locking system uses radio-frequency identification (RFID) to provide more effective, efficient and aesthetically pleasing protection of high-value inventory while enhancing the customer experience in virtually any commercial environment. Senseon is built on patented, proven technology from Accuride® International, a world-leading global designer and manufacturer of movement solutions for businesses for more than 50 years.